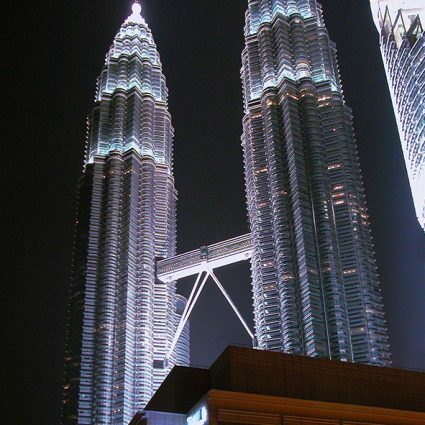 As construction was starting on their twin skyscrapers in Kuala Lumpur, the Petronas oil company decided that the 400-seat meeting room nestled between the towers should be changed to a concert hall, the first such room in Malaysia. 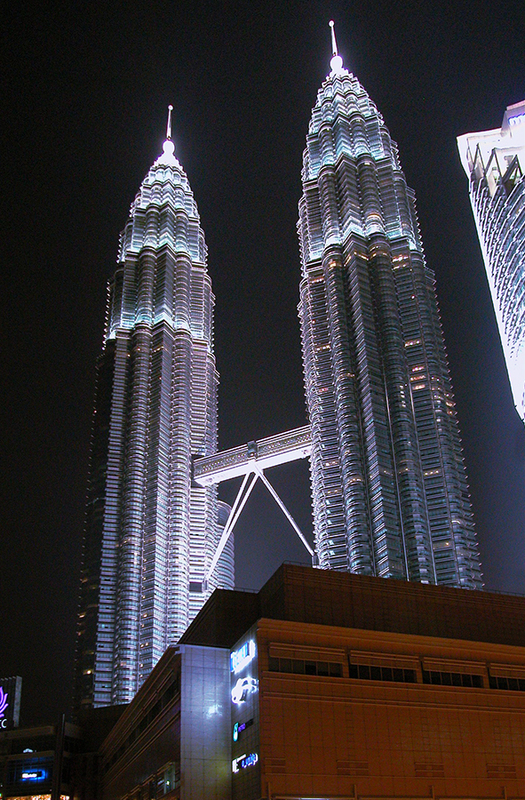 Because of strictly limited space between the towers, the building’s grand lobby and a six-story mall, the primary direction for growth was upwards. The result is a 74’ x 132’ footprint that includes a full concert stage and over 850 seats on three levels. The design takes its inspiration from the traditional ‘shoebox’ shape of the great European concert halls built in the 19th century, still widely acknowledged as the finest acoustic environment for the performance of symphonic music. 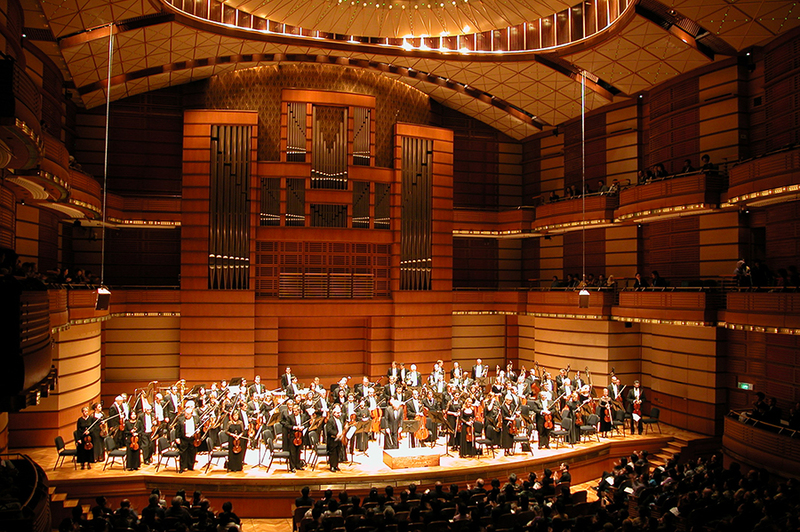 To ensure its suitability as a modern concert hall, unique acoustic devices have been incorporated into the design of the auditorium to maximize its natural acoustic qualities. 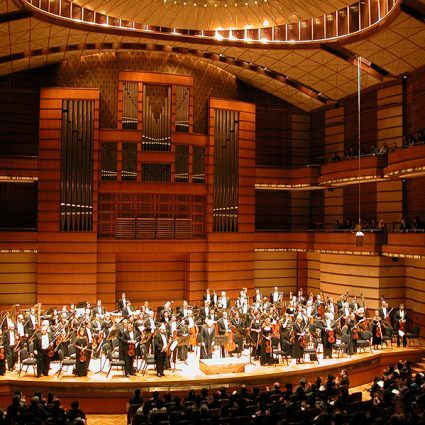 This creates a flexible performing environment which will complement a wide range of musical performance styles, from solo recitals to large-scale symphonic and choral works and traditional Asian cultural performances. The truly unique aspect of the acoustic design is the ceiling. The perforated metal ceiling vault appears solid but is in fact acoustically transparent, allowing sound to travel to an upper ceiling. 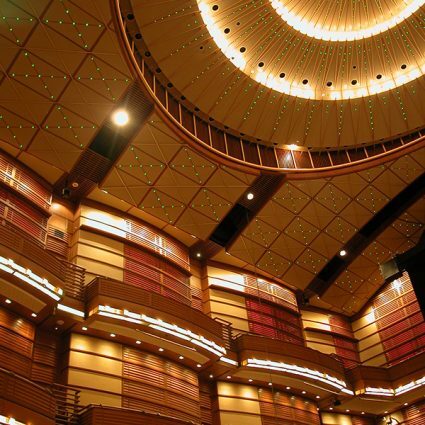 The upper ceiling is composed of seven movable panels which can be adjusted to alter the volume of the concert hall and simulate a wide range of acoustic environments. 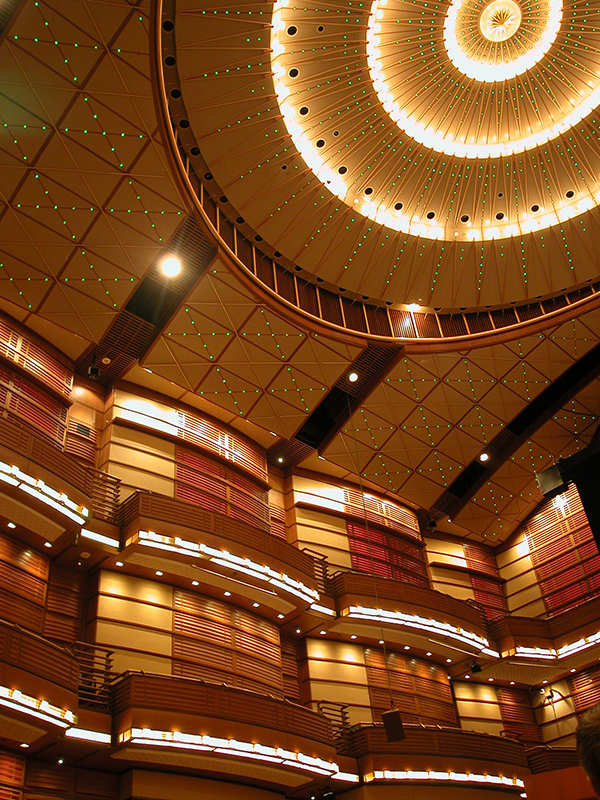 Special acoustically absorptive panels in the side walls can be opened or closed to adjust the resonance of the auditorium. Encased in a grid of hand-carved Malaysian wood screens with bronze accents, the walls and balconies have been shaped to reflect sound both to the audience and the musicians while avoiding echoes. All materials and finishes have been carefully selected to further enhance the acoustic quality. The lowest setting for the ceiling is at 58 feet above the stage, the highest at 81 feet.